Keeping up with the news used to be pretty simple. You picked up your favorite tabloid or broadsheet newspaper on the way to work, or tuned into a scheduled news bulletin at some point on the radio or TV. The Internet has transformed the way in which news is created and distributed though. Keeping up with the colossal melting pot of professional news outlets, blogs and citizen journalists can be a huge headache. Where do you check first? How do you keep up when you only have a smartphone to hand? A swathe of newsreader apps are available on the App Store, but only a small selection are worth your time and attention. Here, we run down a selection of the best supported on the iPhone. 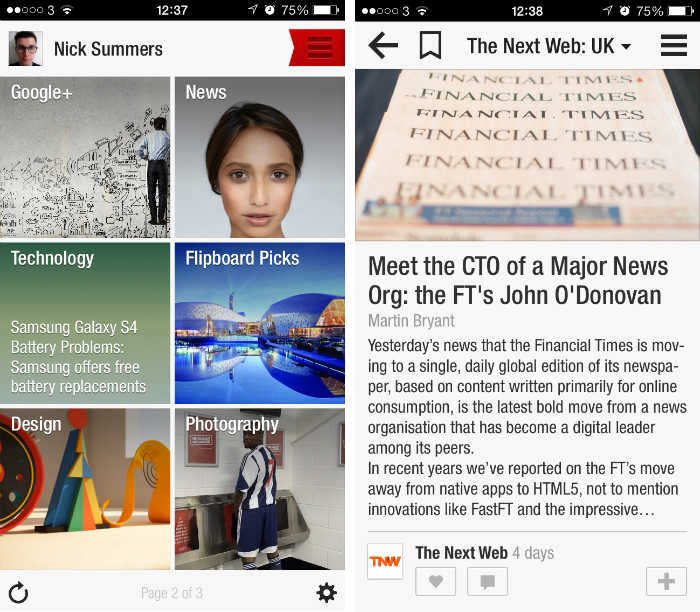 Flipboard strives to repackage the best content on the web as mobile-centric digital magazines. Better yet, it gives you granular control over what news sources are included in each faux-publication. Essentially, you can use the app to create your dream magazine. This beautiful newsreader app can also leverage content from social networks such as Twitter, Facebook, Google+, LinkedIn. You decide which accounts you want to connect, as well as choosing from content categories such as technology, design, business or politics. You can subscribe to individual blogs and sources using the red ribbon icon, or save specific articles for posterity in a personalized magazine. Above all, Flipboard also offers a beautiful, clean reading experience with its trademark ‘flip’ animation between pages. 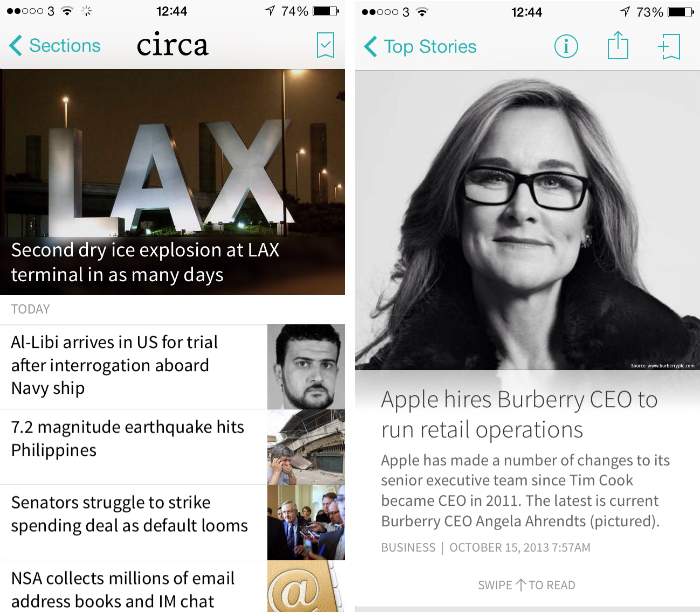 Circa is a relatively young app, but its treatment of news stories and streamlined interface makes it an incredibly exciting prospect. Instead of simply regurgitating articles from the Web, Circa uses a team of in-house editors to create new, bite-sized stories with only the essential facts, quotes or photos. These are then isolated so only a single story segment is visible on-screen at any one time. The concise nature of each ‘chunk’ and the shorter length of Circa’s articles help you to burst through the news easily and efficiently. In short, it’s news reimagined for mobile. The app has been built from the ground-up to help users who want to scan over the news in a short space of time. There’s only a handful of news categories for now, but we expect that roster to grow pretty quickly. Pulse occupies a similar space to Flipboard, bringing you content from a multitude of different news outlets based on specific topics that you’re interested in. Supported categories include technology, gaming, women’s health and men’s fashion, among others. These sections are then listed in a standard side bar, each of which contains a grid of tiny squares representing different articles. Each horizontal row represents a different publication and you can add your sources by scrolling down to the bottom of the screen. A lot of information is crammed in here, but it’s a neat overview that gives you the ability to choose from a wide variety of stories. The reading experience is also top-notch, with a readable typeface and uncluttered design. 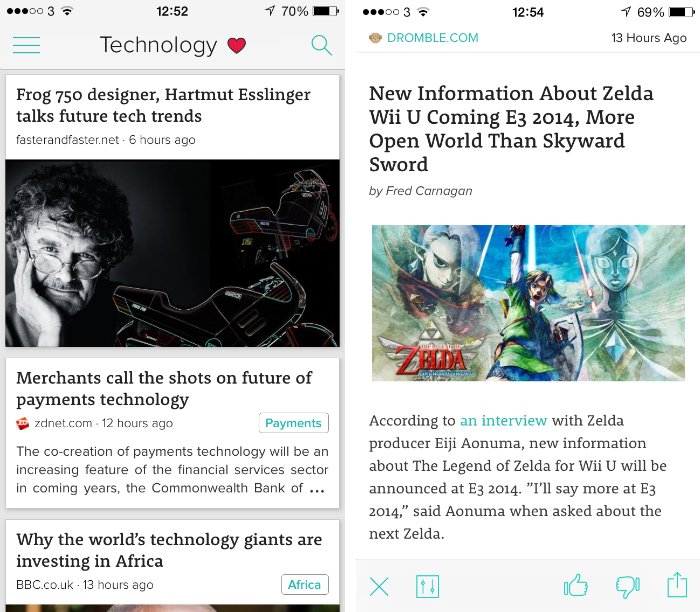 Zite wants to make the Web beautiful. The home screen shows a vertical feed of relevant articles with large, gorgeous photos underneath. It’s a joy to use, although you won’t be speeding through reams of newswires. You can pick your topics and favorite news outlets, or ask for some suggestions based on your Pocket list, Twitter and Facebook accounts. The joy here is that you can go for really specific subjects; for me that included The Legend of Zelda and the PlayStation 4. The app also improves its recommendations based on your reading habits. So the more you read, the smarter it gets. You can also search for any topic using the magnifying glass in the top left-hand corner of the screen, which means you’ll never be left craving an interesting article to read. When you consider what Google is known for, Currents just doesn’t feature. Search, Gmail and Google Maps; these are the products that the technology giant is known for. 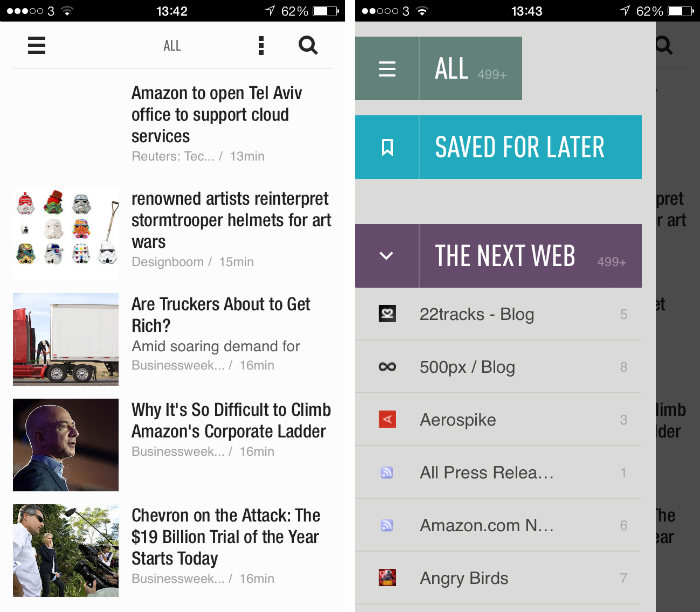 Google Currents is a solid app though. Content is displayed in a vertical feed similar to Zite, alongside a range of pre-determined publications under topics such as news, lifestyle, and sports in the sidebar. It doesn’t feel quite as flexible as Zite or Pulse – navigation just feels a little more convoluted – but it is still possible to look up and add custom publications. Swiping left and right lets you switch between different publications within a category, while tapping the drop-down menu changes the section used by that particular website of blog. The formatting of each article is sleek and easily legible; you can also share each piece to Pocket, Instapaper and a handful of social networks. 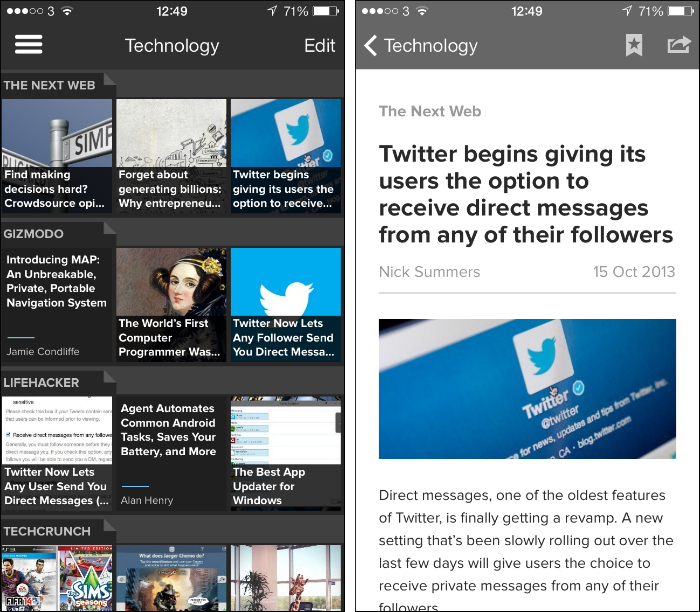 Feedly is an RSS app that many claim to be the logical successor to the now-retired Google Reader. If you’re used to managing custom lists and adding specific feeds, it’s an incredibly powerful tool for keeping on top of the news. What you won’t find in Feedly, however, is a list of article suggestions and recommendations. Finding appropriate content is ultimately your responsibility; that’s fine for RSS enthusiasts, but a little overwhelming for newcomers. When you first launch the app, don’t be surprised if you’re greeted by a blank page. Once you’ve created a critical mass of feeds though, the app is incredibly powerful. It’s incredibly quick to refresh and supports multiple layout types, so you specify exactly how much text or imagery is shown on-screen. 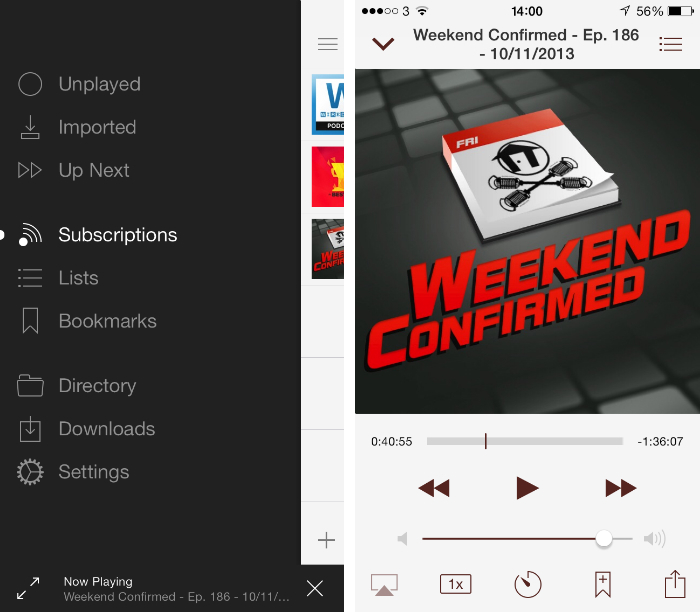 If you’re looking for an alternative, we also recommend Reeder 2. 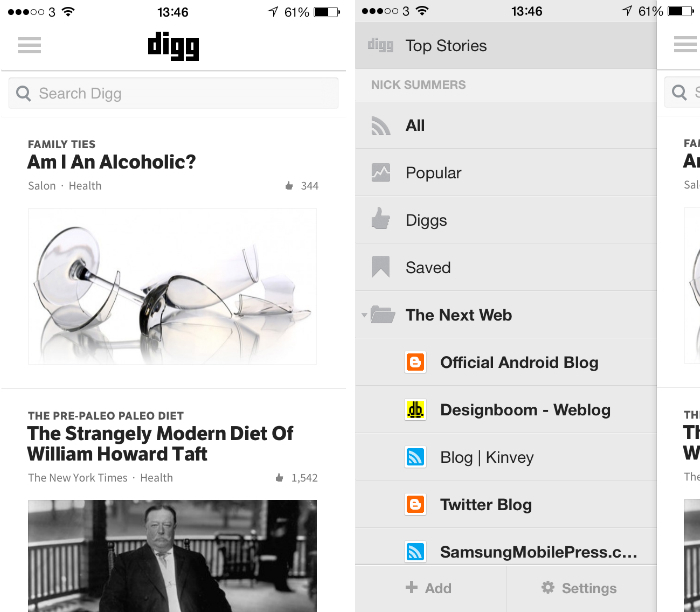 Digg is an iconic, social news aggregator site that was acquired and relaunched by Betaworks last year. Today, it stands as a reliable source of news and in-depth features from across the Web. The iOS app tailors Digg’s minimalistic interface for the smaller screen, allocating just the right amount of space to headlines, photos and news sources. Articles can be viewed as a Web page or reformatted to fit in with Digg’s clean, uniform aesthetic. There isn’t much in the way of filtering or categories (aside from a generic search bar) but Digg’s knockout punch is the inclusion of an RSS reader, similar to Feedly. 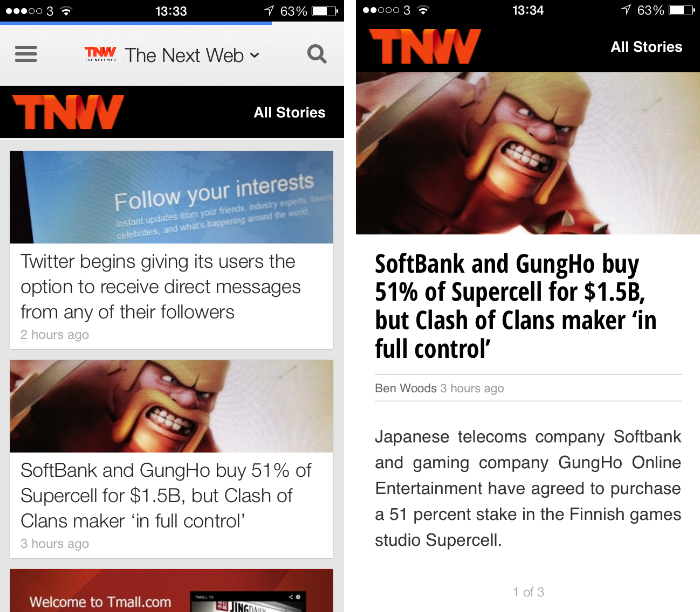 A single tap brings in a side bar with all of your custom feeds and lists, where you can also add news sources and save articles for reading at a later date. Pocket is our preferred ‘save it for later’ reading app on the iPhone, although Instapaper works just as well. Whenever you stumble across an article that’s interesting – it could be from an email, a tweet, or just aimlessly browsing the Web – you can save it to Pocket and carry on with your current task uninterrupted. 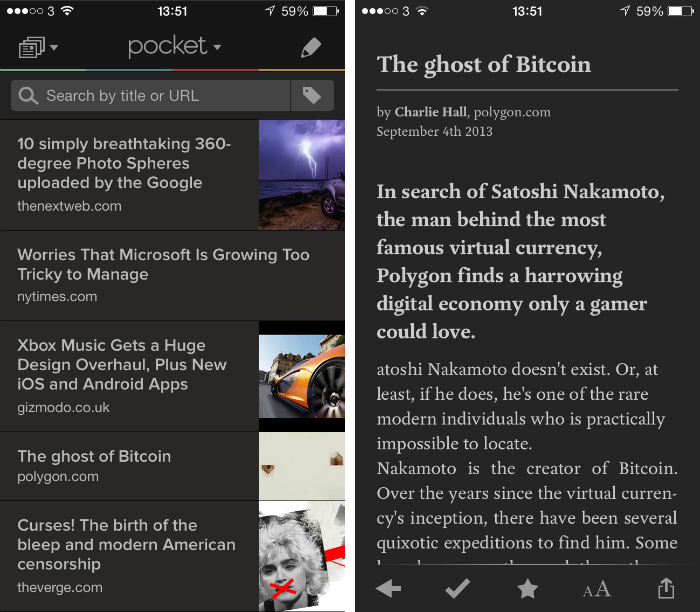 Pocket then downloads the article to your devices for safe keeping. So whenever you find yourself with some time to kill – maybe you’re waiting at an airport or stuck on a train for at least a few hours – you can pop open the app and dive into your curated reading list. You’ve hand-picked all of these articles, so there’s no need for Pocket to offer you suggestions. The app displays each story with a stripped back design, devoid of color except for the occasional photo or link. It’s incredibly elegant and easy to read, but if you prefer the original Web view that’s also available at any time. Magazines and newspapers still play a pivotal role in news reporting. They operate on a different news cycle to the Web and often facilitate investigate reporting and long-form journalism that then sets the agenda online. Many readers still enjoy the nuances of magazine design too; the slim columns of copy, eye-catching headlines and stunning photography. Zinio brings a digital version of these well-loved publications, including The Economist, New Scientist and The New Yorker under one roof. 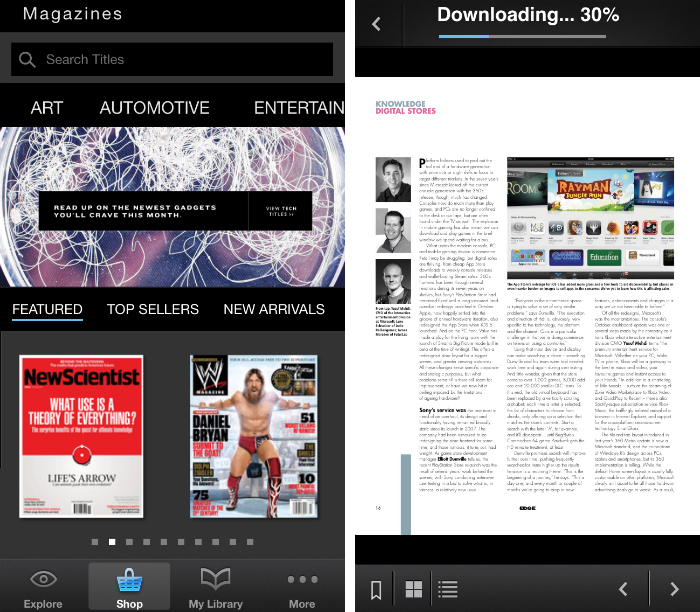 You can use Zinio to buy single issues or grab a discount with a full-year subscription and unlike Apple’s Newsstand (which we also recommend) you can access these issues on your Android or Windows 8 device. Just download the companion apps and your library will be synced automatically. At school, I discovered I was an auditory learner. Since then I’ve become a podcast addict, constantly on the lookout for new shows that I can subscribe to. The default Podcasts app for iOS is serviceable and Downcast certainly has its fans, but nothing comes close to Instacast in my opinion. The design adopts the flat, translucent aesthetic pioneered by iOS 7 and makes navigation simple through an intuitive sidebar. Searching the directory is slick and responsive, so you’ll have a library of active subscriptions up in no time. The app will also download the latest episodes in the background and notify you when they’re available, so you won’t be stuck when you’re caught without an Internet connection. Want an alternative? Try Pocket Casts. Plenty of publications offer their own dedicated iOS app. It doesn’t matter whether it’s The Guardian, The New York Times or NPR, if you have a favorite news outlet it’s probably worth checking out their own app offerings.